Sky Map with the name of the stars and constellations. Doodle Cosmos VECTOR Background, Seamless Pattern, Hand Drawn Colored Planets on Bright Blue Sky. 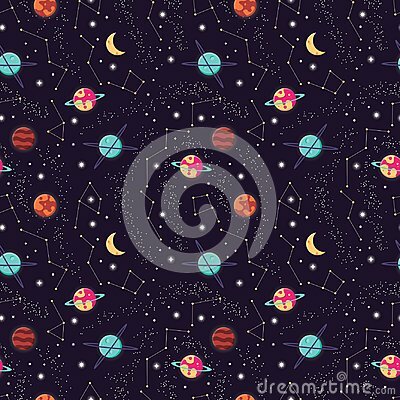 Space vector seamless pattern with galaxy, planets, comets and constellations on dark background. Vector Background with Planets and Stars, Cosmic Backdrop, Paper Art. Naive kawaii night crescent moon space seamless pattern.